GST or Goods & Services Tax has been implemented in India from July 1st, 2017 and still there are lots of rumours spreading as the new law is not clear to the common man. It is quite natural to see mixed reactions all around.The simple reason is whenever something changes, its not so easy to adapt and people resist that change. To oppose the change, people start spreading negative impact of that changes.In this article we shall try to highlight few popular rumours and tell you the truth or facts behind those rumours. Myth 1 – A regular taxpayer has to file three returns in a month. A dealer is required to file a monthly return which has three parts. First part is details of all outward supplies (sales) made in previous month. Second part is details of all inward supplies (purchases) made in previous month. The second part will be auto generated by GST portal. Dealer is only required to check the details of purchases only. Third part is assessment of tax. Myth 2 – Every dealer is required to generate invoice digitally through computers. Government has not made any rule to generate digital invoices. A dealer can issue invoices manually. The only requirement is that Government has prescribed few details like HSN Code, Place of Supply etc. which must be written on the invoice. Dealers can issue invoices manually also. Myth 3 – Unregistered dealer cannot purchase goods from dealers of other States. ALSO READ GST Bill - Is it a Money Bill ? There is no restriction in GST law to restrict inter-state purchases for unregistered dealers. But a dealer cannot do inter-state sale until he has obtained GSTIN by registering under GST. Myth 4 – A dealer cannot do business without getting final GSTIN. A dealer is required to apply for registration within 30 days when he becomes liable for registration. Once he has applied for registration, a provisional GSTIN will be issued and there is no need to wait for final GSTIN number. Dealer can start business with provisional GSTIN as well. Myth 5 – GST rates are high and it will result in increase in prices of commodities. The higher GST rate of 18% and 28% give inference that GST rates are high. However, this is not the truth as earlier excise duty was not visible to customers. Only VAT was showed in their invoices. But, after GST regime complete indirect tax is visible. You may also like : Impact of GST on common man ! Myth 6 – Small Businesses will not survive as internet is necessary after GST. Internet is required only for uploading returns. Even internet is not required to prepare returns. Invoices can be prepared offline. Small businesses will require internet only for final uploading of returns to the GSTN Portal. Myth 7 – Details of every invoice is required to be uploaded on GST Portal. If a dealer is only doing retail business, there is no requirement to upload invoices on GST Portal. Only invoices need to be uploaded in case of B2B transaction i.e. where a business sold goods to another business. If a dealer is only selling goods to final consumers, there is no such requirement of uploading invoices on GST Portal. Myth 8 – Reimbursements to employees will be subject to GST. GST will not be levied on reimbursements to employees, Government has clarified that GST will not be levied on reimbursements given to employees. However, gifts exceeding Rs.50000 in a year given to employees will be subject to GST. Myth 9 – GST to be levied even if customer sells old jewellery to jeweller. Government has clarified that GST will not be payable if a consumer sells his old jewellery to a jeweller. Only if an unregistered jeweller sells old jewellery to a registered jeweller, then GST will be paid under reverse charge. Myth 10 – Composition Scheme can be opted only after paying taxes on whole stock lying on June 30th. If an existing dealer is having old stock lying in his premises on June 30th and now he wants to opt for composition scheme under GST, he is not required to pay GST on stock. Businesses and tax professionals can use the single platform of Taxmann’s One Solution for multiple compliances of GST, ITR and TDS. GST invoice generation is made easy with ready-to-use invoice templates which can be used to configure invoices as per your business. Upload invoice details with GSTN seamlessly and process GST Return filing with maximum ease. Avail end-to-end GST solution for timely and accurate compliances. Synchronise your existing Accounting Software with One Solution for all GST, ITR and TDS related compliances. Work with Taxmann’s One Solution in offline mode. Connect to internet only while uploading returns to the GSTN Server. Taxmann GSP application, One Solution offers secure and private connection for transfer of data to the GSTN server. ALSO READ Budget 2018 Impact on Salaried: Tax changes for Common man! 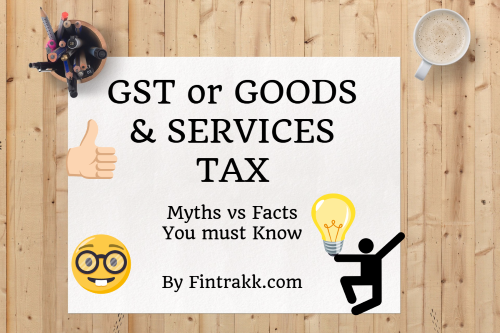 Some of the myths about GST might have been cleared after going through this post.However, things shall become more clear as people get used to this new tax regime. If you have any opinions or feedback related to this new tax reform : GST or Goods & Services Tax then do share it in the comment section below. GST is a new tax and it shall take some time for everybody to adjust to it.